When I was growing up in the 1950s, missile kits were very popular with offerings from Revell, Monogram, Renwall, Airfix and most of the other major manufacturers. 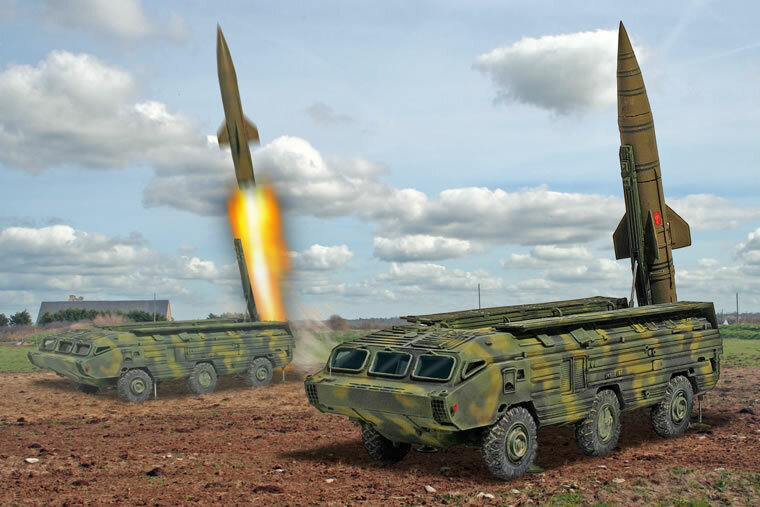 These days, missile kits are few and far between, but fortunately, they occasionally appear from the cottage industry. 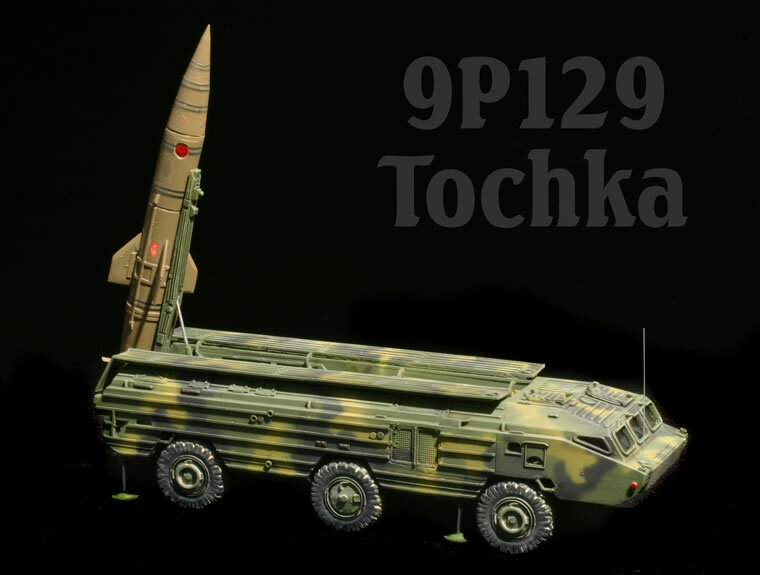 I am a particular fan of Soviet ballistic missiles, so I was especially pleased last year when Retrokit in the UK announced a 9P129 Tochka tactical ballistic missile launcher vehicle, or SS-21 Scarab for those more familiar with the NATO designations. Retrokit has an eclectic selection of kit covering a broad range of hard-core buff subjects including things like a Leonardo Da Vinci tank, "War of the Worlds" tripod war machine, and a host of obscure and tasty French AFV and artillery selections. This kit is not inexpensive at around 40 pounds, but it is well molded and based on a sound master. The main hull comes in two major parts with the forward cabin presented as a separate part to permit the interior to be depicted. I didn't bother with all of the interior bits because it can't be seen unless the two upper hatches are left open. Although I was very impressed with the overall quality of the kit, there are some issues. I didn't like the shape of the missile, especially the triconic nose section, so I chucked it into a lathe and reshaped it. The aft section of the missile bay lacks any details (which is not surprising, in view of the lack of references). I used the "gizmology" approach and added some miscellaneous detail, for texture more than an attempt at precise duplication. There are some aggravating mold shift issues along the hull, but I basically ignored them as they would be very difficult to fix without compromising the detail. 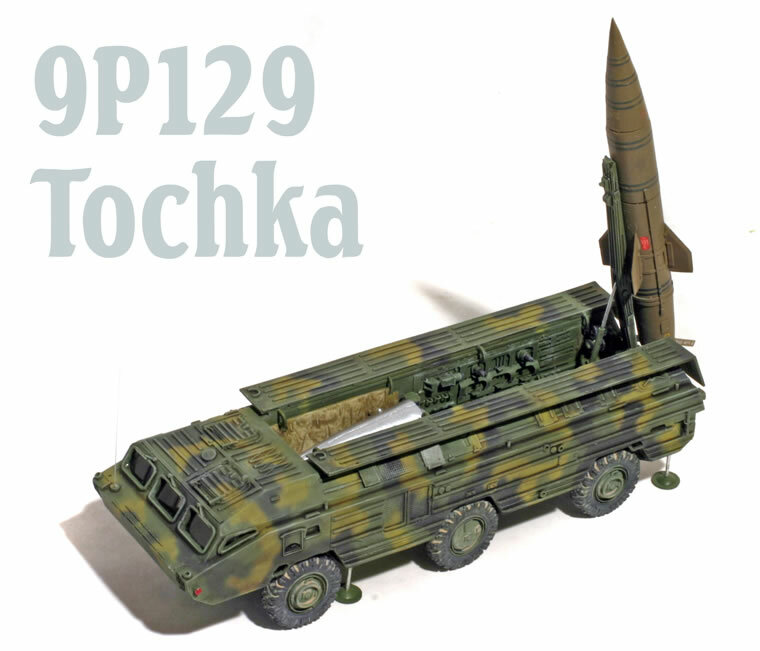 I painted the model in the scheme on a Tochka launcher displayed at a trade show at Nizhi Novgorod back in the late 1990s. 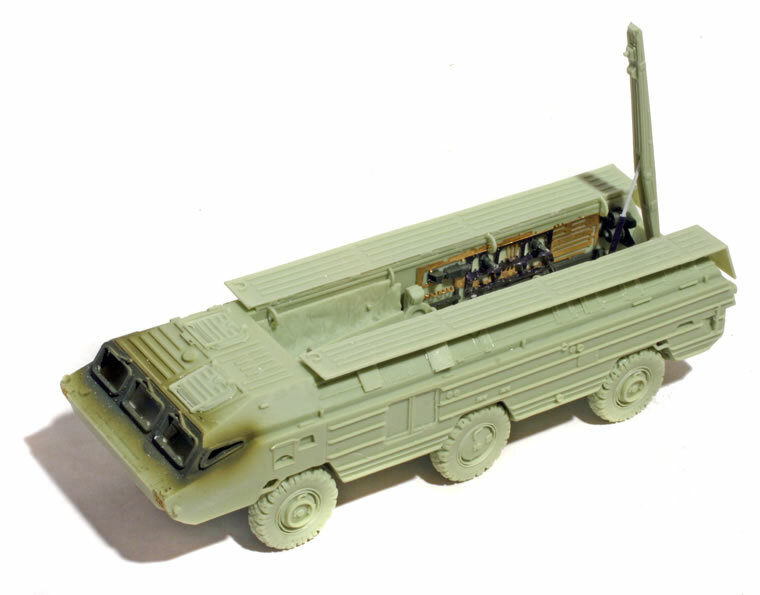 These missile vehicles tend to have rather bland markings except on the missile itself. I made some decals for the missile on my ink-jet printer, mainly the bands used for aligning the missile for transport. Overall, this was a straight-forward little project for anyone experienced in small-scale resin kits. These kits require a fair amount of care compared to conventional plastic kits, so I would only recommend the kit to modelers experienced with this sort of offering. Retrokit is certainly on the high end of the small scale resin manufacturers, but even so, they take considerably more effort than plastic kits.